This image was rendered in TOON by Cheetah3D 5.0b5. 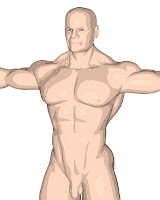 Now, I have been building BONE in this MUSCLEMAN. However, I cannot build well..... hmmm..